Education consultant John Morris, who has worked in schools and colleges across the country, fears Wrexham is leaving many families out in the cold who want their children to be educated in Welsh. He said he had been contacted by a number of parents who had tried to get their youngsters into Welsh schools only to be turned away. And he claimed the local authority was not doing enough to ensure there would be adequate provision to meet demands for Welsh language education in the future. Mr Morris said: “I have had families come up to me and tell me they haven’t been able to get their children into schools with education provision in Welsh language. People have seen the success of schools in Wrexham which provide Welsh language provision such as Ysgol Plas Coch, Bodhyfryd and Morgan Llwyd. But schools are completely under resourced to cope and at Plas Coch they have put up two mobiles because of the extra demand." The authority’s Chief Learning and Achievement Officer John Davies, said: "The authority is still in the midst of carrying out a feasibility study on a range of possible sites and locations for a new primary welsh-medium language school in Wrexham. This should be completed within the next few weeks. Once this is completed a report will be submitted to the executive board in late April, where members will agree on a preferred option. The authority will then carry out a full consultation, which will seek the views of a wide range of stakeholders about that preferred option. "There is sufficient accommodation in our Welsh medium schools to meet the current demand. All pupils who have applied for places at Welsh medium schools in Wrexham next September have been allocated places and two of our Welsh medium primary schools still have some places available." This sounds suspiciously like a case of "he said, she said". Whenever anyone makes an allegation there'll always be someone available to deny it, and the average reader is then left with no means of being able to judge who is telling the truth. Happily, the facts become clear with a little research. This shows that the number of requests for places exceeds the number of places normally available. However it should be noted that the Ysgol Bodhyfryd website says that the school now has an admission number of 60, to refect the fact that temporary space has been found from somewhere. As mentioned in the story, Ysgol Plas Coch also has two temporary classrooms. So Wrexham have just—but only just—managed to find places for those who have made formal admission requests. However they are very obviously heading directly for another crisis since three of the Council's WM schools are already full for this coming September, and it is almost certain that one of the two remaining schools with places mentioned by Mr Davies is Cynddelw which is in Glyn Ceiriog, some 25km away from Wrexham itself. Therefore only one of the four schools in or anywhere near Wrexham has any space left ... a full six months before the start of term. The survey is particularly relevant now because the children in question are those born between September 2005 and August 2006, those starting formal education this year. The main figure is that the parents of 269 children would be very or fairly likely to send them to a Welsh medium primary school if there was one within 2 miles. This is not an extrapolated figure, it is the actual number of responses. The response rate was only 32% and it would be inconceivable that all of the remaining 68% would not want to do so. So that 269 is a minimum figure. But the sustainable admission number of all WM schools in Wrexham is only 162, for although the temporary accommodation might allow for the figure to be increased for a year or so in the short term, there are seven year groups in total. So at a minimum there are at least a hundred children whose parents want them to have WM education, but for whom there are no spare spaces. That is solid proof that John Morris is right to say that parents are being turned away. So what is happening? I think the main reason for the difference is that parents usually make informal enquiries in the first instance. If they are told that the WM schools near them are full (and Wrexham have confirmed that three of the four in or near Wrexham already are for next September) they will simply not bother making an official application. Another important factor is that if parents have been unsuccessful in getting their children into WM nursery education they might well feel that their children have already fallen behind, so that even though they might have wanted WM education a couple of years ago they now feel it is too late to catch up. This is very well illustrated in the diagram below, which shows that only 4% were able to get their child into a WM nursery or playgroup, which is very low even though about half of the parents thought their children too young to send to a nursery/playgroup at the time. To my mind this shows that we must make Parent and Toddler groups, called Ti a Fi (you and me) in Welsh, and nursery provision a priority. 2.12 Respondents were asked if they felt they had received enough information to make a decision about primary education for their children. The majority (64%) did not feel they had enough information to make this decision (Figure 14). 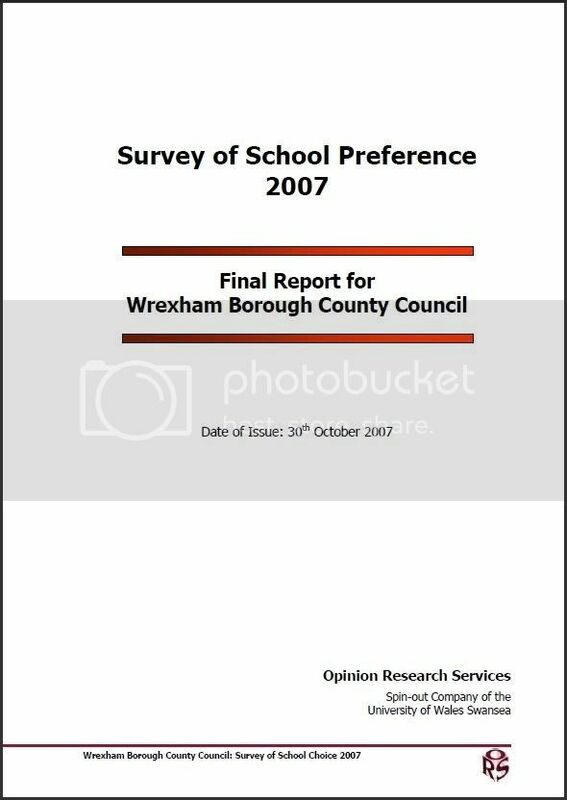 2.13 89% of respondents did not feel they had received enough information about the schools in their area. Only 74 respondents (11%) felt they had enough information regarding schools in their area (Figure 15). 2.14 An even higher percentage of respondents (94%) felt they had not received enough information regarding the application process for primary education. Only 40 respondents (6%) felt they had enough information on the application process (Figure 16). 2.15 Furthermore, 93% (579) respondents had not received information on Welsh medium schools (figure 17). To my mind this borders on wanton negligence by Wrexham Council. It makes the figure of 44% who did respond positively all the more remarkable, and this lack of information might well be why the overall response rate only reached 32%. All these factors act to reduce the numbers that make official applications for WM places, and I think it is reasonable to say that local authorities take advantage of this as an excuse for not supplying the number of WM places they should. I think that the third option is clearly the best, because it provides more WM places than the other two. However, even if it is approved, it adds only 45 places per year to the 162 places currently available. It would still leave a shortfall of at least 60 places each year. If people in Wrexham want this, you must keep campaigning for it. I hope this analysis will help. The analysis most certainly does help and thank you for it. As with your previous blogs we will make John Davies and Aled Roberts aware of this blog. Just a few points Min y Ddol in Cefn Mawr is also a Welsh Medium School and Ysgol Llanarmon is a bilingual school. Also there are more Nursery places than what you have indicated. You rightly mention Ti a Fi and there is a group in Gwersyllt but there is also Mudiad Ysgolion Meithrin and their Cylchoedd Meithrin particularly at Summerhill with 29 children and Hill St. But I agree the general trend is that demand is not being met and we have recognised and raised the fact that we need a second WM school in the Borras Park area. The option appraisal/feasibility study is due to be discussed at Executive Board this month. Thanks PG. As always, when I start going into detail, I miss out the detail elsewhere. Min y Ddol and Llanarmon are indeed the two very small schools I mentioned but didn't name. I didn't include them in the figures because they have only about 20 pupils and, like Cynddelw, are some way from Wrexham. I'm certainly glad to hear about greater pre-school age provision. And I'm very glad that you're thinking ahead to where the next WM schools should be after Gwersyllt. Just looking at the map, it does seem that East Wrexham has a hole in provision that needs to be filled.